Munster survived a huge scare to return to the top of Conference A of the Guinness PRO14 following victory over the Dragons at a rain-lashed Rodney Parade. Johann van Graan's side have been on a fine run of form since their defeat to Ulster before Christmas, but they only won by the narrowest of margins in Newport. Jean Kleyn's try cancelled out a Lloyd Fairbrother effort and Bill Johnston's penalty responded to a home conversion from Josh Lewis. 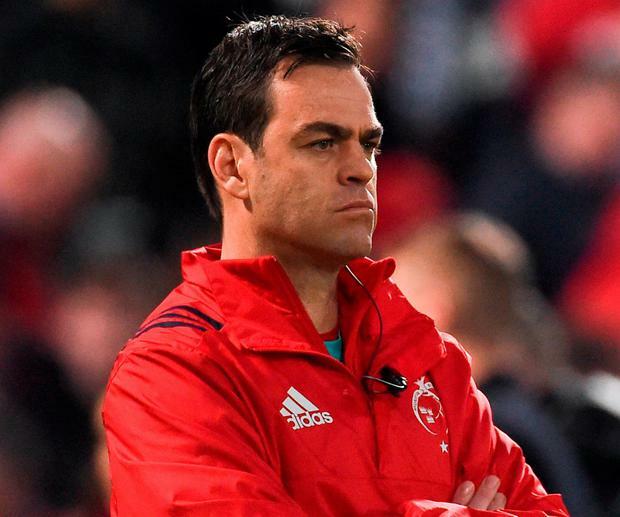 Horrendous conditions meant this was never going to be a classic and Munster turned around 7-3 down and with work to do. A poor surface meant the kicking battle was vital and the Dragons edged it early on as they forced Munster to spend long periods in their own half. Mike Haley had a clearance blocked by Tyler Morgan and although danger was averted, the hosts were soon ahead. Lewis kicked to the corner and a driving lineout ended with prop Fairbrother driven over. Fly-half Lewis added the conversion. The weather, if anything, worsened. Munster did wake up before the break. Jared Rosser was fortunate to escape a yellow card for upending Johnston, but the outhalf booted a penalty. The visitors had now woken up and with the clock dead at the end of the first period, Stephen Archer was driven over. Referee Ben Blain - on his PRO14 debut - consulted TMO Dave Pearson who could find no clear proof of a score. Lewis skewed a drop goal effort along the ground when the game resumed before Munster then stamped their mark. Darren Sweetnam chased a kick through though he was unable to get downward pressure on the ball as Will Talbot-Davies got to it first. It gave Munster prime field position where they turned down kickable penalties in favour of the corner. Repeated lineout surges saw Matthew Screech sin binned and when the set-piece was reset, Muster somehow contrived to spill the ball. Still, Munster were a man up and at last they broke through with Kleyn emerging from a pile of bodies in the corner. His score put Munster ahead for the first time, but Johnston couldn't convert. Lewis then skewed a penalty wide and it was really one he should have kicked. The final 10 minutes turned into an absolute dogfight but Munster held on for the win. Dragons: J Williams; Rosser, Morgan, Dixon, Talbot-Davies; Lewis, R Williams; Harris, Hibbard, Fairbrother, J Davies (Evans 64), Screech, Keddie, Cudd, Griffiths.